Alternators provide the necessary power to the automotive electrical system for all operating conditions occurring during the driving operation. This also ensures that the starter battery, as an energy store, is always sufficiently charged. The charge limitation of the battery must always be so adjusted to the practical operating conditions of the vehicle that at least as much energy is produced as all consumers can use at the same time. Initially, Alternators produce alternating current which, because of the electrical storage, must first be converted to direct current. The armatures are made of magnetisable quality steel with narrow gap dimensions between the rotor and the stator and ensure maximum performance. The rotor is balanced to achieve quiet running and low wear on the ball bearings. The voltage regulators are equipped with quality carbon brushes. These ensure long, trouble-free operation. The material of the rectifier is particularly temperature-resistant. The insulation is designed for temperatures up to 240 °C. The stator consists of magnetisable special steel and precisely calculated coils, which are equipped with a temperature-resistant electrically non-conducting insulation. The rectification of the alternating current by over-voltage rectifier diodes ensures a long-term operation, even at maximum performance and with high voltage fluctuations in the automotive electrical system. 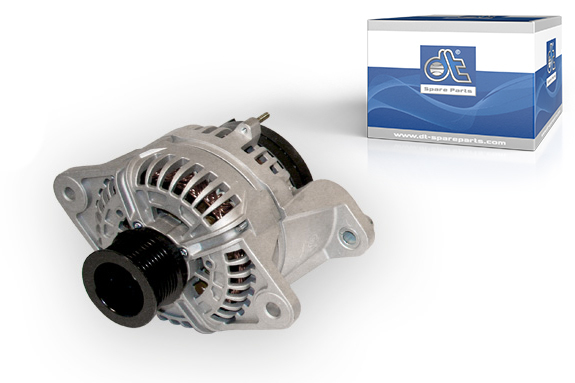 DT® Spare Parts alternators contain performance bearings from Europe and Japan for a long service life.